At the heart of the Natural Park at 950m above sea level, our wood frame rentals are ideally located to explore the Jura. Enjoy on site a multitude of activities in any season, in a preserved natural environment. Privilege calm and serenity, a pedestrian access is arranged through the forest to lead you to the comfort of your Chalet. Warm with its wooden interior and stove, it is also very bright thanks to large windows. Anxious to improve your comfort, you will find a fully equipped kitchen, rooms with private bathroom, wwifi connection, private terrace. The beds are made on arrival. Sheets, towels and cleaning products provided. The cleaning is done by our care at the end of stays. The most for your well-being - Beds made on arrival - Towels provided - Maintenance products provided - Cleaning at the end of the stay - Free WiFi connection - Open all year - Prices all charges included Le Duchet offers free access to the heated outdoor swimming pool (July and August), outdoor children's play area, tennis and volleyball courts, swin golf, fitness trail, botanical trails. Catering on site or at the Duchet. Grocery store and bakery 2 km. Nous avons beaucoup aimé notre petit séjour au chalet. Tout est très bien pensé, très bien équipé et très propre. A recommandé sans hésiter! 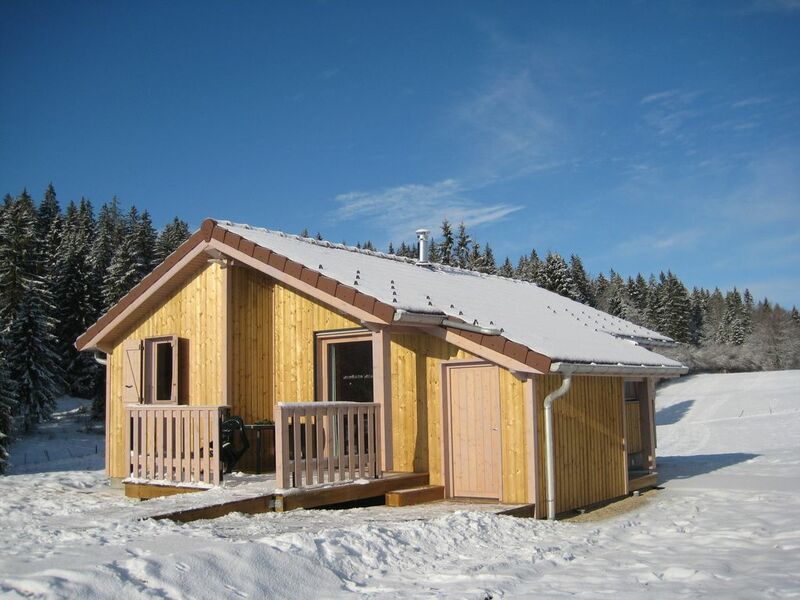 With varied terrain and unspoiled nature, the Haut-Jura is the area of ​​hiking, cross-country skiing and snowshoeing. Many marked trails pass by the cottages. Nearby you will find an adventure trail, a climbing site and a rental equipment (mountain biking, cross-country skiing and snowshoeing). Hedgehog waterfalls, cheese factories, know-how workshop, Vouglans dam, etc. Nos tarifs établis à la semaine se font du samedi au samedi ou du dimanche au dimanche. Possibilités de courts séjours du lundi au vendredi à 270€. Nous consulter si vous souhaitez séjourner sur quelques nuits seulement. Paiement possible en CB, chèque et chèque vacances. Draps et linges de toilette – Entretien : Les lits sont faits à votre arrivée et sont équipés de couettes.